Silver brazing can offer a solution when joining thin materials or when joining dissimilar items, hard solder brazing alloys usually have a melting temperature between 400 and 900ºC. People speak about brazing when the base metal to be brazed has a higher melting point than the brazing material itself. 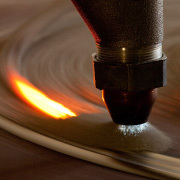 Brazing alloys that contain phosphor (for example L-Ag15P) are developed to join copper to copper without additional flux, (the phosphor cleans the surface and lowers the surface tension). Copper to brass is possible but our Superflux have to be added. The addition of silver reduces the melting point, increases corrosion resistance, increase strength and improves capillarity.